Seeking True North, Day 6: Whitehorse, YT, to Yellowknife, NT. As we were leaving the cabin this morning, we finally took a right turn on unpaved Policeman's Point Road, rather than the left turn that takes us to the main highway. The hard-packed, smooth surface soon gave way to randomly scattered gravel and thence to deep ruts. 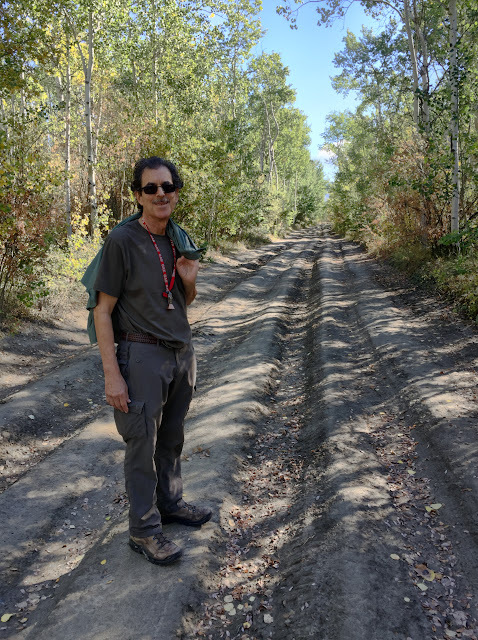 Speculating that the road might eventually lead to the Yukon River, we decided to walk the remainder of the way after we saw a little turnaround where we could park the car. As Scooby Doo put it so well, "Rut road!" This is when we implemented the textbook version of "What Not to Do" when walking on an isolated road. If there was a mistake to be made, we not only made it, we embraced it. 1. Be prepared. Upon leaving the car, we took our bear bell...and that's all. We had bottles of water in the car. Left them there. We had insect repellent, a significant advantage since the roar of buzzing insects when we exited the car sounded like a motor humming. Left the bug spray in the car. Let's just say, we had most anything we might have needed...and left it in the car. 2. Know where you're going. We had a strong cell signal where we stopped and could have easily dropped a pin on Google Maps to help us keep up with where the car was parked. Didn't. We could have consulted a map app to find out if the road did lead to the river. Nope, didn't do that either. 3. Don't veer off track uninformed. The road did indeed lead to the river with a splendid view of the Yukon. 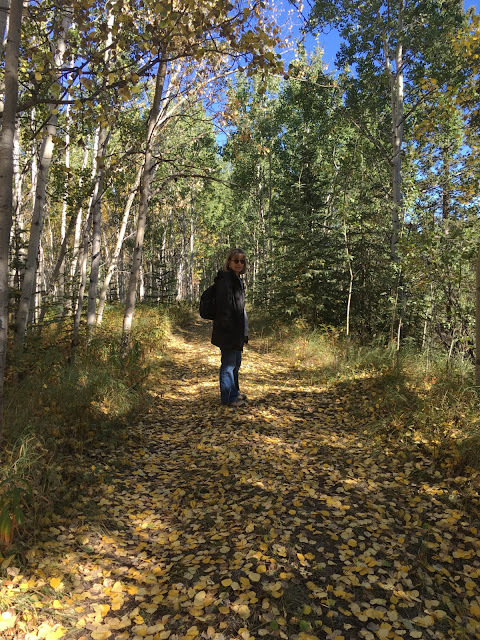 When we were ready to return to the car, we decided that a pretty little trail through the woods looked more appealing than the deeply rutted road. After walking on this winding lane for longer than it took us to reach the river, we began to wonder whether it would actually intersect the road or not. No thanks to our lack of foresight, we did eventually reach the road. Turn left or right? Again, through sheer luck, we chose the correct direction. Let's go this way. It's prettier! A mile and a half and 45 minutes after we left the car, we returned to it, marveling that we could have been so foolish and hoping we had learned a lesson for future explorations. Only time will tell. After turning in our mud-splattered, dust-covered car at the airport, we learned that Air North, the Yukon airline we were flying to Yellowknife, limits carry-on luggage to two items, weighing a total of 22 pounds. Oops! No, Mr. Agent, sir, there's no need to weigh our bags to determine whether we can meet that criterion. As much as we try to avoid it, we each had to check a bag. Another opportunity for us to learn a lesson. Or, more accurately, re-learn. Before we traveled to Australia and New Zealand a couple of years ago, our good friend BJ, who had recently been down under herself, alerted us to the strict limits on what you could bring on board. Each passenger was limited to 7 kg (15.4 lbs). Thanks to her warning, we had no difficulties with our bags. In fact, we marveled at how liberating it was to have such light loads. Yet when we returned, we fell right back into the habit of packing more, even though we knew we could get by with less. Now with another Air North flight as we leave Yellowknife, we know what to expect, and we have now sworn that for our trip to Alaska next month—where we'll have several flights on small aircraft—we're going to "pack Australian." Few people enjoy the company of young children more than I do. Usually at family gatherings, I'm off playing with the kids while Ken catches up with the adults and fills me in later. But when an overbearing three-year-old tyrant is sitting behind me on an airplane, it's not so much fun. 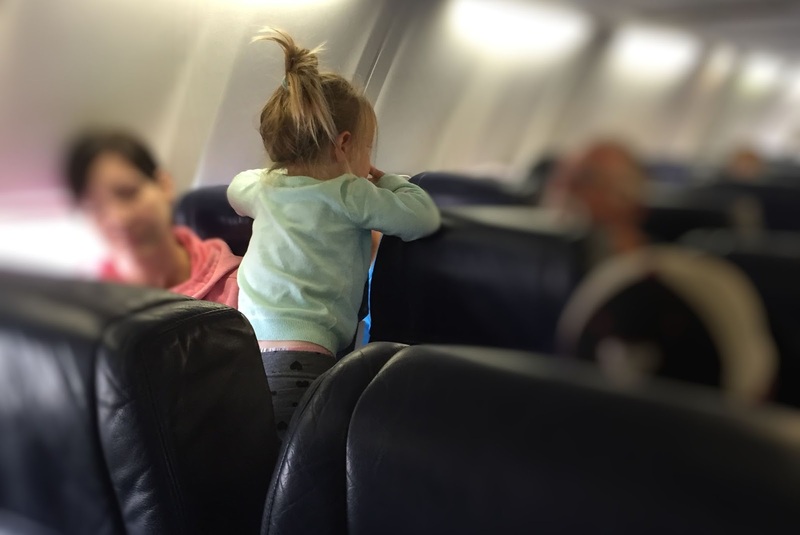 "Olivia" was traveling with both her parents, yet she was clearly in charge, ignoring every plaintive suggestion that mommy and daddy timidly proffered. Stop kicking the seat in front of you. Be quiet. Sit down. Keep your seat belt buckled for take off. Olivia either ignored them, demanded to know "Why?" or both. Father: "Do you think you could stop kicking Daddy for a few minutes? Please?" So glad we were sitting in front of, rather than behind this undisciplined child. For most of the flight, she stood in her seat, tormenting the poor passengers behind her, trying to hit them, issuing orders to them. Since they were getting a little reprieve from her berating them, mommy and daddy ignored this behavior. To make a long and painful story shorter, when we arrived in Yellowknife, Olivia and her parents stayed on board to continue to Ottawa. So we happily parted ways, feeling great pity for those sitting near her for the next four-hour flight. We had dinner at a local joint and a great talk with some Yellowknife residents. More about that tomorrow. We're looking forward to exploring the town and vicinity.